Things to keep in mind while picking that engagement ring! Ladies, cover your eyes and ears, ‘cuz this one ain’t for you! So guys, now that I have your attention, I first want to wish you a big congrats for not only taking this step, but also for actually researching on how to pick the perfect engagement ring BEFORE you buy it. Getting engaged is one of the most important and emotional moments in your life which makes choosing the right engagement ring very important. Also, it’s most probably one of the most important investments you'll make, so the pressure on picking the right one is really there! First things first, you gotta decide your budget, before you do anything else! It will help you to zero down on your options wisely and also allow the jeweller to show you the ones which are in your price range! “More and more men these days come in with their girlfriends to help them pick out a ring. While letting her pick a ring, is a sure-shot way to find ‘the one’, but at the same time you’re denying yourself of something too big - A once-in-a-lifetime opportunity to show how thoughtful and romantic you can be! 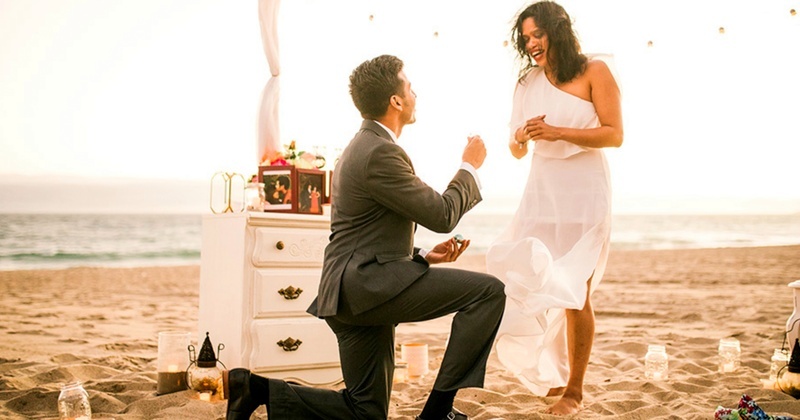 I mean just imagine the look on your girlfriend’s face when you’ll propose!” - from a guy who proposed and surprised his ladylove with his grandmothers ring! “ A lot of men often screw up in the purchasing process. They have the perfect ring picked out, but they somehow get the size of the finger wrong! Although, all is not lost if that happens! You’ll just have to take the ring back and fork over some extra money to get it resized. Although, the best way to get it right is by stealing (temporarily) a ring that she isn’t wearing to the jeweller to be measured. Just be real sneaky about it, they can smell it from afar about these things”. - the guy who did manage to get the size right! Yes pinterest is the way to it, but let’s be real she’s most probably pinned anything and everything that looks good! To pick a ring that she’ll go over the moon with, will score you some brownie points that will last a lifetime, so do your research properly! “When you’re with your girlfriend, take note of the type of jewellery she wears. Does she wear a lot of gold? Or maybe silver or platinum? Perhaps there’s a birthstone she’d like more than a diamond. Platinum - extremely durable, but dulls quickly than gold, and it’s hard to bring back the initial luster! Gold - Shinier than platinum, easier to buff and polish to get back the original luster but, as it’s a soft metal, it wears down faster! It needs to be reshanked in 10-15 years. Cut - A well cut diamond reflects light perfectly! If they are cut too deep or shallow, it leaks light through the bottom or the side of the stone, resulting in a lackluster appearance. So, even if you managed to get the perfect color, clarity, and carat, and the cut ain’t right, the diamond won’t have that fiery brilliance that your fiancé will show off to her friends. Color - Diamond color is graded on a scale that ranges from D (colorless) to Z (light yellow). Truly colorless diamonds are the most rare and most expensive. White color diamonds are the most popular though. Also, when it gets down to selection, the color is all about preference. Clarity - The fewer the imperfections, the more clear & the more expensive the diamond is! When the jeweller starts talking about clarity, they’ll probably mention “inclusions.” They are other minerals or tiny fractures in a diamond. So, the fewer the inclusions the better. Like color, clarity is also measured on a scale. SI1 and SI2 are slightly included but you it’s not visible through a naked eye. So, just find a diamond in this range. Also, avoid stones with inclusions on the top and middle, as this can impact the dispersion of light, making it less brilliant. Carat Weight - Carat refers to the weight of a diamond. The heavier the stone, the more it falls on the expensive side! However, there’s no need to get to caught up on that. Because through proper mounting and shaping, a master jeweler can make a diamond appear much larger than its carat weight! A square diamond and also, the most popular shape for engagement rings right now. An engagement ring is both a financial and sentimental investment. So, it’s a good idea to insure your girlfriend’s engagement ring in case it’s ever lost, stolen, or damaged. Even if you and your wife decide not to replace the ring, you can at least take the cash and go on a romantic getaway. Most women want a traditional diamond ring, but not all! Some wanna do away with the gilt of a blood diamonds! I know planning the surprise and finding the right one can be very exhausting, but just think about what you’ll achieve through it! You’ll be the subject of envious conversations among her BFF’s, your future mom-in-law will think “you’re the one” for her daughter and all the men will silently acknowledge your achievement. So, what are you waiting for? Just get the right one already! Also, if you are fishing for ideas on how to pop the big question, then this will help you out!